A Christmas Story is a film that is ingrained in my brain. My family had the film on repeat in the background of our Christmas festivities throughout my childhood. In fact, that film is so closely tied with my family’s holiday gatherings that I get warm, fuzzy feelings just thinking about it. I imagine the 1983 classic has a similar place in the hearts of many Americans; it’s a film that seems almost mathematically engineered to produce nostalgic coziness. 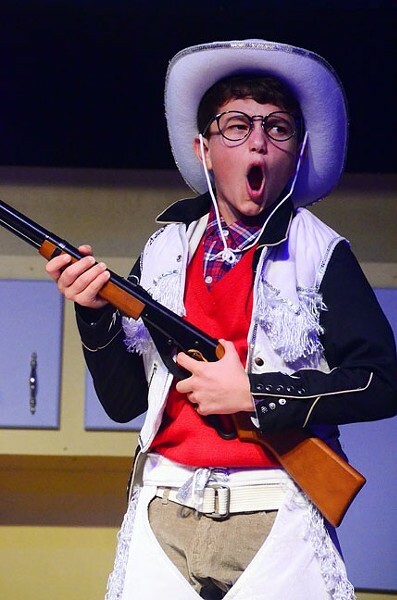 RED RYDER: Drew VanderWeele was perfect as the precocious little Ralphie. He deftly switched from childish meekness in his day-to-day life scenes to over-the-top cockiness in the fantasy scenes. Converting the popular family movie into a family play seems like a slam-dunk. It’s just the sort of charming, heart-warming story that feels like it should shine on stage. But in the SLO Little Theatre production of A Christmas Story, there was something that didn’t quite translate. Actually, it sort of makes sense. The film version of A Christmas Story was like lightning in a bottle. The story itself isn’t all that compelling, the characters are all pretty stereotypical, and there’s not all that much action or progression either. Even the classic bits—a child getting his tongue stuck to a frozen pole or the Christmas turkey getting devoured by dogs—aren’t all that funny out of context. That movie just had this je ne sais quois sensibility that tied these mediocre elements into something that spoke directly to the heart of Americans (myself included). Unfortunately, the play version of A Christmas Story was missing that magical spark. However, it wasn’t for lack of trying. It really felt like the Little Theatre went all out for this show. The set was fantastic. It was a brilliant re-creation of a comfy, suburban ’50s home—even down to the smallest detail, like the ugly couch upholstery. The additions of stairs and a second floor added something dynamic to the set. The coolest part, though, was that the set actually rotated, which breezily facilitated the many quick scene transitions from the home to the snowy outdoors to the school. A lot of the acting was great too. The child actors, especially, really sold the material. Drew VanderWeele, as the young Ralphie, played the precocious greedy kid perfectly. Andy Miklas, who played Ralphie’s little brother, was a blast to watch. He was downright adorable, and the character’s penchant for hiding in cupboards and under furniture was funny every time. The rest of the children felt very natural in their roles too; they’re kids playing kids acting like kids. The children-only scenes were all super cute. The only unpleasant part about the acting was the ear-splitting screaming during the bullying scenes. Those screams were painful and blood curdling in a way that turned a somewhat playful scene from the film into something that felt very cruel. The audience seemed uncomfortable at this point; it’s not enjoyable to watch a child in pain. HOME FOR THE HOLIDAYS: 'A Christmas Story' runs at the San Luis Obispo Little Theatre through Dec. 21. Shows play on Thursdays, Fridays, and Saturdays at 7 p.m. On Saturdays and Sundays, there are additional shows at 2 p.m. Tickets range $15 to $29. For more info, visit slolittletheatre.org or call 786-2440. Going into the show, I was really curious how they’d work in the ever-present voice-over narration that played such a big part in the movie. In the play, the narrator—Ralphie as an adult, looking back fondly on Christmas memories—was actually an on-stage character. Greg Wolff, as the narrator, would stroll around the stage and emote excitedly as he gave his lines. It was both strange and interesting to see this character walk around tableaus of his past life, looking on as his young self went about his day. The narrator was really the starring role of the show. Wolff pulled off quite a feat. He spoke almost nonstop throughout the two-hour long show, with only a few minor flubs. The addition of the narrator as a character was the most major of many changes in the translation from film to play. Among other things, there were a few subplots taken out, a few scenes—like the mall Santa meeting—changed because they’d be too tough to do on stage, and a few new subplots added, including a completely unnecessary romance between Ralphie and a girl from his school. Though the film was most certainly a comedy, the play traded more on charm and nostalgia than actual jokes. In fact, many of the play’s joke attempts were simply references to arcane brands or trends that were popular the ’50s—Lifebuoy soap, for example. These fell flat on the audience every time. Even a property as beloved as A Christmas Story can’t get away with pawning off the “things were different back in the good old days” joke. The comedy that did work was the stuff lifted right from the film. The vignettes that played out in Ralphie’s imagination translated well onto stage and were quite funny, and the famous leg lamp scene was every bit as hilarious as it was in the movie. It’s possible that someone who had never seen the film version would really like this adaptation, but it just doesn’t seem possible to recapture that heart and that precise mixture of reverence and subversiveness that made the movie a classic. You can contact intern Cliff Mathieson via Arts Editor Jessica Peña at jpena@newtimesslo.com.